Subscribe to Airspeed through iTunes or your favorite other podcatcher, listen to audio at http://airspeed.libsyn.com/, or download directly at http://media.libsyn.com/media/airspeed/AirspeedWhyIFly.mp3. Flying has to be about the most expensive, demanding, and exasperating thing that I’ve ever loved. In fact, many of those qualities are at the core of the reason that I love it. Sometimes that’s counterintuitive to non-aviators. They wonder why I and my fellows do as we do. So I thought about it for awhile. On a recent Sunday afternoon, I took my five-year-old son, Cole, to an FBO at the airport. He sat and watched his Speed Racer DVD on the portable player with headphones while I flew practice approaches and holds on a simulator in preparation for an instrument stage check. The FBO with the simulators is near the southeast corner of the airport and just a few hundred feet south down Airport Road from the fence where you can stand in the parking lot of an avionics shop and watch the airplanes landing on 27L and 27R. It was a beautiful afternoon, so I grabbed the radio out of my flight bag, tuned in the tower, and walked with Cole up to the fence. Not much going on, but I did hear one twin Cessna out at ERNST get clearance to shoot the backcourse for 27L. I explained to Cole where to look for the twin and we watched it come in and grease the landing. Not much else going on and we were just getting ready to walk back to the car when a Jeep pulled in off of Airport Road and stopped in the little parking lot. A guy in his forties or fifties got out. “Are you a pilot?” the guy said. It’s a post-911 world, and the thought occurred to me that this might be the airport manager or someone similar who was uncomfortable about a guy with a radio standing by the fence. I explained that I was, indeed, a pilot and that I was an instrument student in a Part 141 program kitty-corner across the field, taking care to use as many code words as possible to convey to the guy that I belonged there and that I posed no threat. We talked some more. Turns out that he’s a Northwest 757 captain who flew Phantoms for the Marine Corps before joining the airlines. I expressed the requisite awe (mainly because I genuinely felt it) and he shook it off diplomatically. We exchanged business cards and shot the bull for a few more minutes and then he was off with a smile and a wave. What a cool thing. I belong to a group that includes this guy. A guy who regularly flies more than 200 people 2,500 miles at Mach-point-eight and who used to fire guided munitions inverted and under spleen-crushing gee-loads with his hair on fire – all before lunch. He sees a suburban schlub and his five-year-old with their noses pressed against the fence at the airport on a Sunday afternoon and his heart’s fondest desire is to load them into his airplane and show them the place where they were standing from a thousand feet up. And, as cool as that was and is, it gets better. It would not surprise me if Cole and I were just two of dozens, if not hundreds, of people that got offers just like that one along airport fences all over the country and all over the world that day and other days like it. I fly because I am honored to count myself in the fellowship that includes that guy. It is a proper thing for free men and women to be jacks of as many trades as they can practice. I fly because it is part of the renaissance that many take for granted. Many, if not most, pilots fly better than I do. But it is within my comprehension, skills, and will, to fly competently and safely. If flying were easy, everyone would do it. In some ways, flying is the hardest thing I’ve ever done. Flight is singular in providing a challenge by which to measure one’s self. I fly because it’s hard. The other 98% of the American public – and even greater proportions of humanity elsewhere in the world – lives out lifetime after lifetime not knowing of a genuine third dimension that unfolds as little as five hundred feet above its collective head. Timothy Ferris wrote in his book about astronomy, Seeing in the Dark, that most people, when asked to extend an arm up and point to a right ascension halfway between the horizon and the local zenith, choose an angle that’s a good 10 to 20 degrees low. That’s because most people literally don’t think of the sky as including anything that they don’t normally see from under their own eyebrows. The 40 degrees or so of sky directly above – 20 degrees each side of vertical – just doesn’t exist for most people. Who can blame them when most live in urban areas where the sky glows with a dimly yellow sodium iridescence from sundown to sunup and all but the brightest stars and planets are obscured? But just a little way up, there’s a different world. 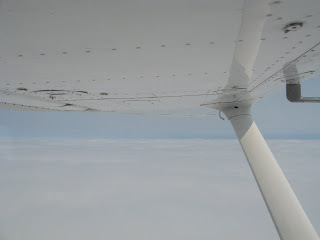 Even VFR, you see things from the cockpit of a general aviation aircraft that others just don’t see. The sun reflected on a frozen lake. Freeway traffic moving or not moving, according to the time of day. Crops being sown and harvested. And IFR is yet another story. There’s nothing like climbing up from the solid gray world as it gets brighter and then more ragged and varied, and then you finally climb into the sun. If you’re really lucky, ATC assigns an altitude that lets you just drag your wheels in the clouds and stir the hillocks and mounds of piled cotton with your wingtip vortices. Many fly commercially and that does count for something. But the view out the side window of a human mailing tube simply cannot compare to the view out the front window. Meeting an aircraft-carrier-sized cumulous cloud head-on and broadside five thousand feet up in a painfully blue summer sky – That’s what I’m taking about. I fly because I never, ever get tired of that. All of the eggs of my species are in one basket. Every aspiration, dream, or idea – Every song, novel, poem, speech, or thought of homo sapiens has occurred within about 250,000 miles of the surface of this planet. The overwhelming majority within 100 feet of it. It is likely that there exist one or more asteroids or comets between the sun and the Oort Cloud that has our planet’s name on it. It is all but certain that a cataclysmic impact has radically changed our planet’s climate and habitability at least once in the last 65 million years. If you think of thing in terms of the right timeframe, it is almost certain that this will happen again. The time frame in which I am thinking includes the time when humankind will still be in existence. I am as subject to the rhetoric of exploration and adventure as anyone. From Buzz Aldrin to Jack Schmidt to thousands of others before and since, I believe in the human need to explore. But even if I didn’t, it is a matter of survival of the species that we develop the technology, practices, personnel, and political will to place some seed of our species in another place. That we allocate our eggs to more than one basket. I fly because it gives me a broader understanding of the technical and emotional challenges associated with aerospace and grand missions such as outboud colonization and because, in some small way, it gives me the credibility as an advocate and teacher who can explain this imperative to others. I was cruising the web the other day and I came across one of the most intriguing airplanes I’ve ever seen. At a small airport in western Pennsylvania lives a Cessna 150, tail number N66089. It’s like many other Cessna 150s of its vintage – except that it is painted in the blue and gold livery of the United States Navy Blue Angels. A Cessna 150 has about 100 horsepower under the cowling, cruises at 90 to 100 knots, and climbs at about 600 feet per minute on a good day. The Blues haven’t flown aircraft since 1949 that wouldn’t stall at the Cessna’s cruise speed. Yet there exists a humble Cessna 150 that bears the blue and the gold. I fly because someone in Pennsylvania painted a humble Cessna 150 in the livery of the Blue Angels, probably has a ball flying it, and probably doesn’t give a tinker’s damn what anyone thinks about it. In many ways, I am 089. And so are you. And neither you nor I give a tinker’s damn who might have a problem with that. I once saw an IMAX movie about the Space Transportation System (some call it the Space Shuttle). It was telephoto footage of the system about 30 seconds after launch. It’s a little hazy because the camera is looking through so much atmosphere and because it’s humid there in Florida. It adds a dreamlike quality. You can see the orbiter’s engine bell. It’s spitting exhaust and going like a bat out of hell. You can see the engine bell vibrating – flopping around a little. Then they throttle up and the bell just snaps to. No more visible vibration. Rock solid. Holding the strain in perfect balance. Taut. Going flat out at 110% or more of rated power. I fly because humans can make machines like that that can bear them off of the world of their birth. I fly because the best and highest energies of humankind have, at every point since 1903, been best demonstrated by the then-current aircraft and spacecraft. One of the most inspiring sights I’ve ever seen is a flight of the Grumman Cats. It was at the Kalamazoo Air Show in 1992 or so. The museum maintained an F4F Wildcat, an F6F Hellcat, F7F Tigercat, an F8F Bearcat, and an F9F Panther. The Navy supplied an F-14 Tomcat for the formation. The formation had to be very carefully executed because the Wildcat’s top speed is just about the same as the Tomcat’s stall speed. On the last pass, the formation flew the Missing Man. All you hear as the formation comes in are rotary engines. Then, just before the formation overflies the crowd, the Tomcat lights up the afterburners and pulls up to the near vertical and all you hear is the thunder of the twin Pratt & Whitneys as the Tomcat heads up into the blue. I challenge you to experience that and not get severely choked up. If you can, we can’t be friends. I fly because there are men and women who bridge time and space by restoring, maintaining, and flying these aircraft and I want to be at least a little like them. Flying – at least flying of the kind most worth doing – requires courage. It’s not courageous to do a thing that holds no challenge for you. It is also not courageous to do a thing in which you’re incapable of recognizing the risks. The former is overconfidence and the latter is stupidity. For me, having flown is having met the enemy – certain of my insecurities – in the sky where they were familiar and I was not. Continuing to fly is to continue to subject myself to an environment that requires commitment, training, skill, and nerve. I fly because it is courageous to do so. Ever see a jet demonstration team perform a high show? About halfway through the show, they do the sneak pass. I saw it one particular time during the Blue Angels’ show at Selfridge ANGB in May of 2005. You’ve just watched the diamond go by and you haven’t quite thought about where the solos are. Then they’re right on top of you. Two McDonnell Douglas F/A-18 Hornets from behind at more than 500 knots and less than 1,000 feet off the deck. They make a sound like someone is unzipping the very sky. Tens of thousands of people freeze simultaneously. No one even has the presence of mind to look up. There’s no time. It’s suddenly just there. It grabs you in the small of the back, runs up your spine, and grabs you again at the back of your neck and just shakes you. I was there. I was in full military battle dress uniform. I was a number-one badass in my narrow shades and my shiny boots. And I heard that. I was rooted to the spot. Everything else was silent. It seemed to last for minutes. And I realized that my face was wet. And I didn’t care who saw. I fly because I want to be a part of that. No matter how small the part, I want to be a part of something like that. Lastly, have you noticed that all of the best dreams are about flying? All of them. Sure, there’s music and there are various reasons for the flying from love to victory to every other happy thing. But it remains that there’s always flying. Even those who have never flown in an aircraft of any kind fly in their dreams. It is natural and instinctive in the human psyche that flight necessarily accompanies love and victory and the fondest desires of the heart and mind. Play double basses and mandolins, write novels, heal the sick, coax sustenance from the ground, launch rockets, and fly jets. These are things that humans do. Because, if we work long enough and hard enough – and if we are lucky enough – we can do these things. Just us. With our opposable thumbs and out oversized braincases and our boundless curiosity. I fly because to do so is to be one with the highest aspirations of my species. To daily demonstrate that homo sapiens is no longer earthbound. To taste some small piece of what it will be like when we take our first real steps into the cosmos. Music: Jon Schmidt, Prelude – from the Podsafe Music Network. Check it out at music.podshow.com or see Jon’s website at http://www.jonschnidt.com/. It’s the season for icing here in the midwest. As some instrument-rated and other pilots can tell you, few things have higher pucker factor than looking out at your wings while you’re in the clouds and seeing ice begin to form. Most general aviation aircraft don’t have de-icing equipment on board and even those that do often aren’t certified for flight into known icing conditions. For most GA pilots, that means avoiding icing in the first place – and that requires the development and use of the most effective anti-icing tool you have. Your noggin. Kurt Blankenship is an NASA Icing Research Tunnel Operator, NASA Glenn Research Center Pilot and the Center’s Aviation Safety Officer. He served in the United States Marine Corps as a CH-53 Helicopter Crew Chief from 1981 to 1985 and then worked for Continental Air Lines as a mechanic. He then attended Bowling Green State University and was a flight instructor and director of maintenance for the school’s flight department during that time. He was a corporate pilot and mechanic from 1990 to 1994 and has been with NASA Glenn since 1994. 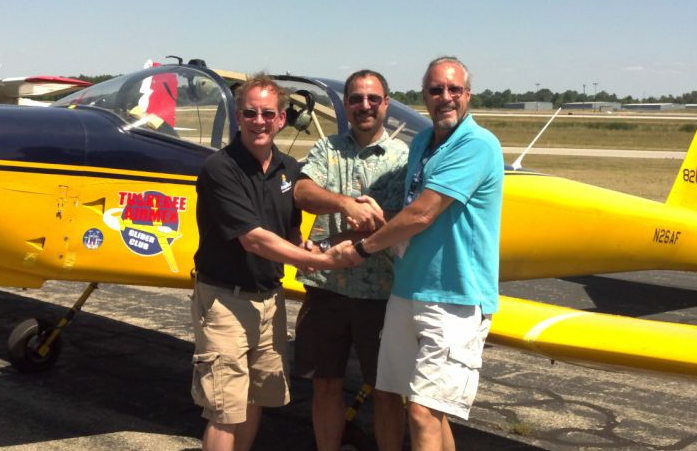 He holds commercial, flight instructor, and airline transport pilot certificates and, in addition to flying NASA Glenn’s icing research aircraft, he is type rated in Learjets and has over 1,000 hours of flight research time. NASA Glenn’s icing research aircraft is a modified DeHavilland DHC-6 Twin Otter. It is powered by two 550 hp Pratt & Whitney PT6A-20A turbine engines that drive three-bladed Hartzel constant speed propellers. Its relatively large size makes this aircraft a versatile test bed for in-flight icing research reaching speeds of 150 knots with a range of 500 nautical miles with a maximum fuel load. The Twin Otter has been modified to carry a full complement of sophisticated instruments that measure and record important properties of icing clouds. A stereoscopic camera system documents ice accretion characteristics of the aircraft in flight. Those who aren’t pilots or who haven’t undertaken instrument training might be a little mystified by some of the terminology that you’re about to hear, so here’s a quick glossary. MEA: Minimum Enroute Altitude ( or “MEA”) is the recommended minimum altitude that an aircraft should fly on a segment of an airway in instrument meteorological conditions. Flying at or above the MEA ensures clearance from terrain and obstacles, ensures reception of signals from ground-based navigation aids and, in a radar environment, makes it so that relevant air traffic controlfacilities can see the aircraft on radar. STC: A supplemental type certificate. Aircraft that have type certificates (such as most production airplanes) must conform to the specifications in their type certificates or be registered as experimental or not flown. You can’t mess much with an aircraft without losing the type certificate. An STC issued by the FAA permits the owner of an aircraft to make the covered modifications while maintaining the aircraft’s type certificate. Frequent subjects of STCs are engine modifications and de-icing systems. There are also several STCs that allow installation of ballistic recovery parachutes in various production aircraft. With all this talk of icing, it might be easy to forget that NASA Glenn does a lot more than icing research. Space exploration systems, microgravity science, bioscience, aeronautic propulsion, instrumentation, and turbomachinery all form a part of the program at NASA Glenn. For example, many shuttle and space station science missions have an experiment managed by Glenn. The Center also designs power and propulsion systems for space flight systems in support of NASA programs such as the International Space Station, Mars Pathfinder, and Deep Space 1. Glenn also leads NASA’ Space Communications Program which included the operation of the ACTS satellite and systems for Cassini. The general public benefits from NASA’s investment in the future through the knowledge gained, the inspiration provided and often technology dividends. NASA Glenn has won many awards including an Emmy, a Collier Trophy, and the 1996 Invention of the Year. Thanks also to Dave Schwartz, an Otter pilot and one of the hosts of Skydive Radio for his contrinbution of background information about flying Otters. You can hear Dave, Stump, and Cory on Skydive Radio by subscribing through your favorite podcatcher or visiting Skydive Radio’s website at www.skydiveradio.com. Image used per NASA’s policy entitled Using NASA Imagery and Linking to NASA Web Sites (October 13, 2005) located at http://www.nasa.gov/audience/formedia/features/MP_Photo_Guidelines.html.